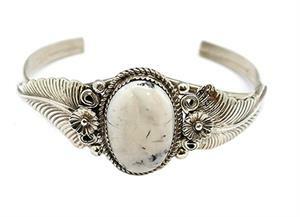 An oval free form white buffalo stone with sterling silver twist wire and sterling cast leaves and flower cups. Center measures approximately 1 1/8" long and tapers down to a double wire shank. It is Navajo hand crafted by Alice Johnson. Color shade and shape of stone may vary.